Photo courtesy of Zachary Nischan Shields. Greetings from INDPLS, new friends! But let me relay to you a tale of a place that has touched me deep down in my soul like not so many things can. 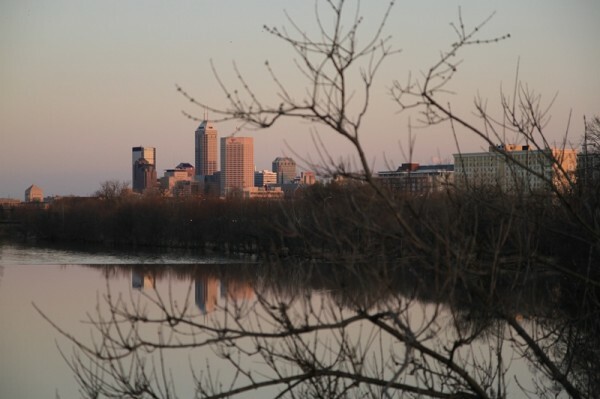 For a number who live here, Indy is the most magical Midwestern city; Steeped in possibility, affordable, walkable, bike-able, jam-packed with public art and home to some seriously nice people. Indianapolis is the 12th most populous city in the United States (sandwiched between #11 Jacksonville, FLA and #12 San Francisco.) As of today our population is approximately 834,852. Indianapolis is the state capitol of Indiana. The capitol used to be in Corydon (pop. 3,122) but in 1820 some powerful dudes decided to move it to the very center (almost) of Indiana. In part because most capitols are located in the center of their states and partially because they mistakenly believed that the White River could be used as a highway for boats. Well they were wrong- Indianapolis is the largest city in the United States on a non navigable body of water. Being our capitol city, downtown is the center of government, so we have a high density of beautiful, historic government buildings, memorials and monuments. Speaking of these beautiful, historic government buildings, this May First Friday (the night out for art here in Indy) brought a once-in-a-blue-moon, one-night-only opportunity to enter the former City Hall building on Alabama Street for an exhibition of work by 47 current, former or graduating students from Herron School of Art and Design. 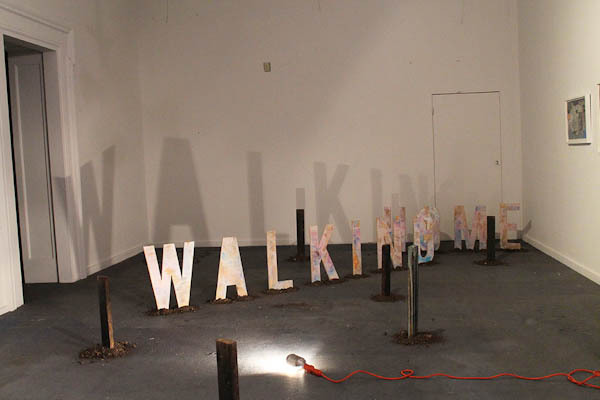 Aptly named VACANT, the exhibit took inspiration from the wildly successful TURF exhibition held in the space during Indy’s moment in the spotlight: Super Bowl XLVI. 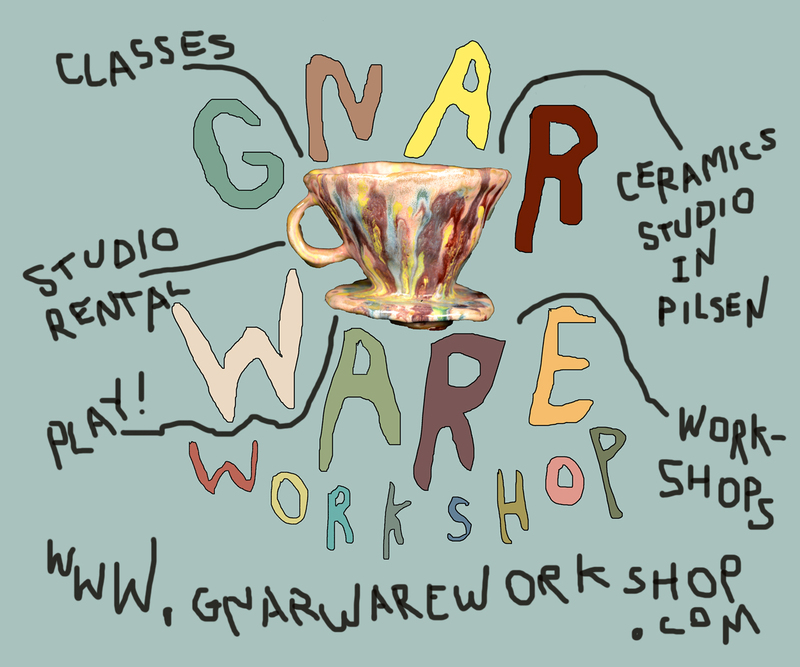 The show was curated by graduation Herron Seniors Taryn Cassella, Anna Martinez and Andrea Townsend. 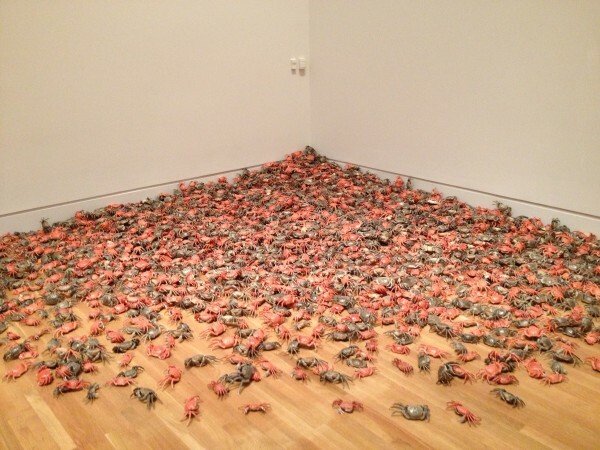 Where TURF was an exhibition of installation art, VACANT included work across mediums. I especially enjoyed Jordan Ryan’s section off the main library detailing the history of the building. A good review with some pictures from the exhibition an be seen on Indy’s weekly arts newspaper, Nuvo’s website. 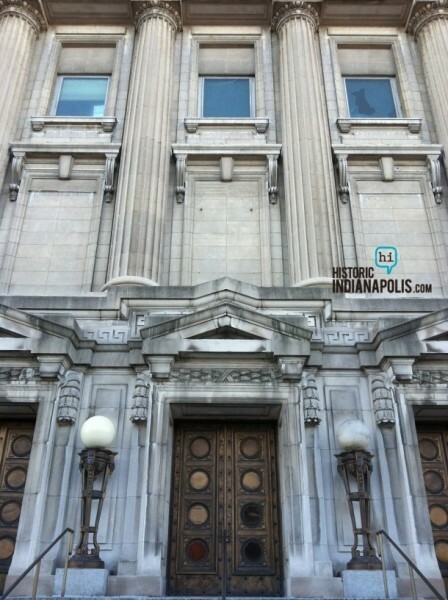 Vacant Old City Hall Building. 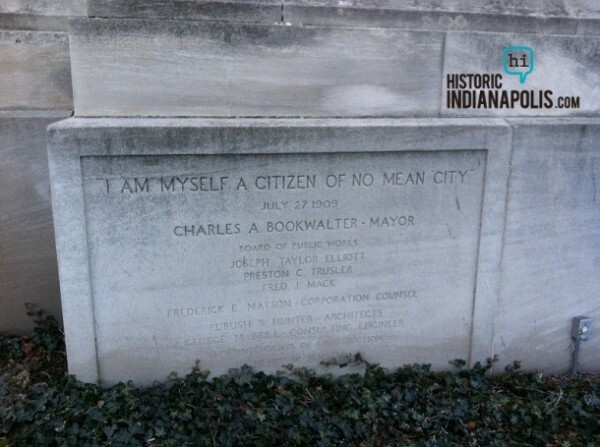 Image via Historic Indianapolis. Jon Keown’s artwork in VACANT. Imagine via Nuvo.net. 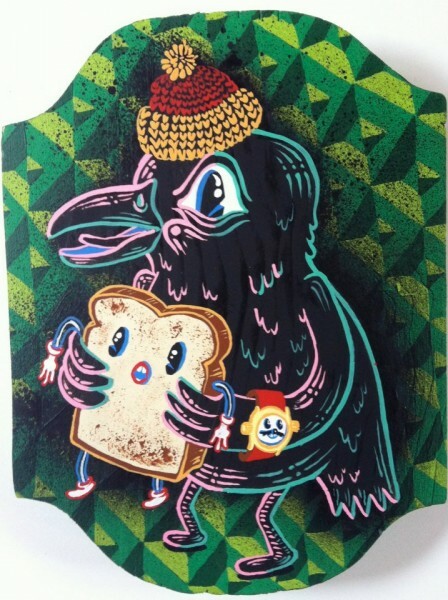 This same evening I also made it to Monster Gallery in Fountain Square (one of the city’s most happening neighborhoods) to catch Portland-based artist Tripper Dungan’s show: What’s For Dinner? This is actually one of the most exciting things I’ve seen lately. 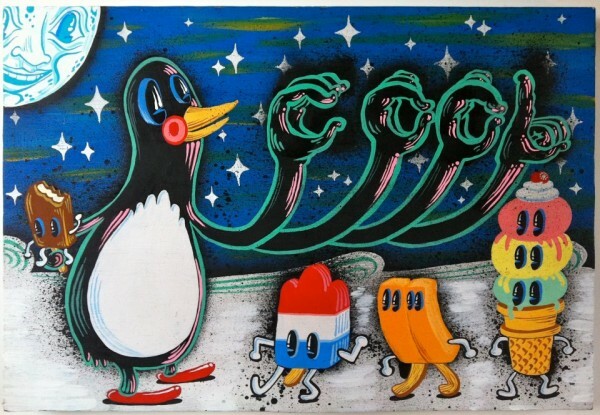 The paintings themselves demonstrate a super high level of skill, extremely tight and in an incredible array of colors. The addition of Chromadepth 3D glasses was almost too much to take. 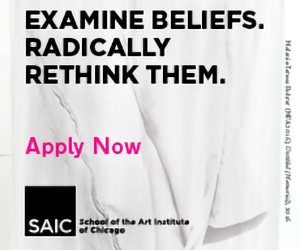 I spent at least an hour circling through the gallery taking in florescent anthropomorphized fast food and dancing psychedelic popsicles popping out at me. It was a visual treat. Plus, Tripper was there and his whole outfit was in Chromadepth and he was a really nice guy. 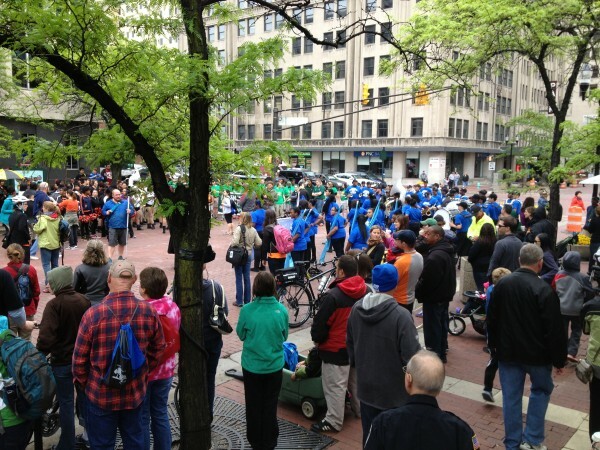 The very next day brought the long-anticipated opening of the Indianapolis Cultural Trail (an 8 mile bike & pedestrian path that connects the city’s seven designated cultural districts.) It was an all-day event that featured tons of free activities along the entire trail. A sampling of what I saw/did: petted an albino skunk, talked to a miniature therapy horse, saw a knit bombed house, and saw live performances by 9 marching bands! 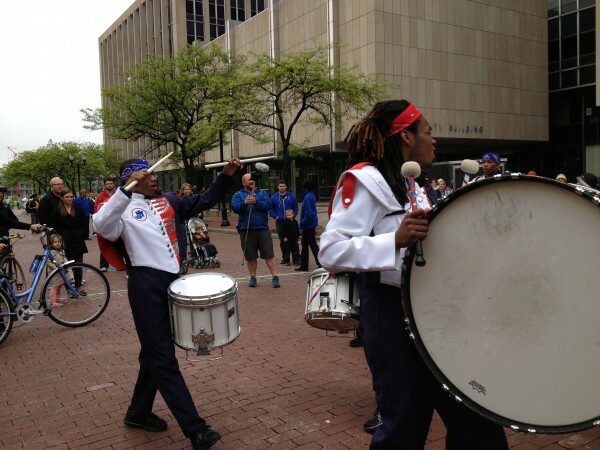 The marching bands were my favorite part because of their historical context in celebrations/mourning, as well as their significance for youth. Six high school bands converged on Market St. downtown with the sole purpose of playing “Get Down on It” by Kool & The Gang. High School Marching Bands converging on Market St.
John Marshall Community High School’s drum line playing “FREAK THAT” on closed down Market St. Downtown. 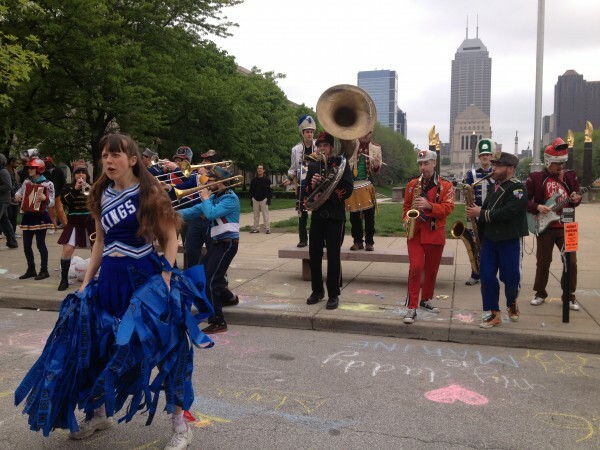 A contemporary twist came through the addition of a free performance on the ground/steps of the Central Library by Chicago’s own Mucca Pazza as well as a Brazilian-style party parade down the trail led by Bloomington’s Jefferson St. Parade Band. Late in the month brought the Broad Ripple Art Fair a fundraiser for the Indianapolis Art Center, (my place of employment) which included 225 local, regional and national artists. 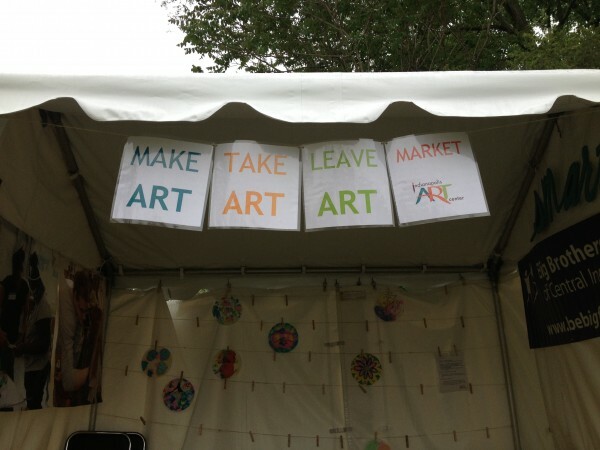 My participation was working the Make Art Take Art Leave Art Market where people could make and trade art for free! I also hosted a poetry reading at Indy Read Books, our only independent bookstore within the downtown area. Here is a Vine from local Poet Doug Manuel’s reading. And lastly at the end of every month the Indianapolis Museum of Art hosts an free event called Final Friday and I typically find myself there. 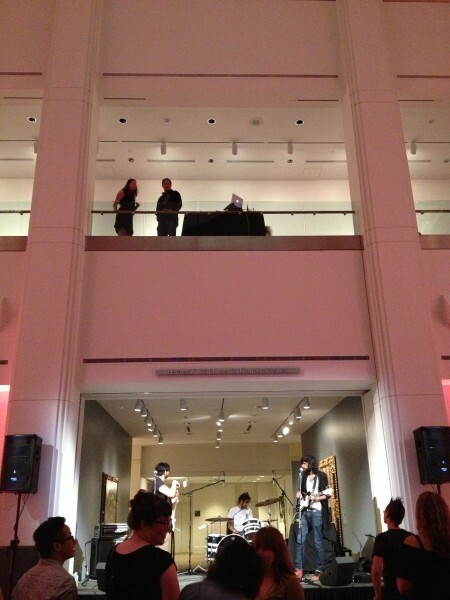 The music is curated by DJ Kyle Long of Cultural Cannibals and features both a DJ set by him and a live performer or band. This month was a Pakistani via Brooklyn garage band called The Kominas. Overall it was a good event. Although I did get in trouble for trying to dance with a Georgia O’Keefe painting. 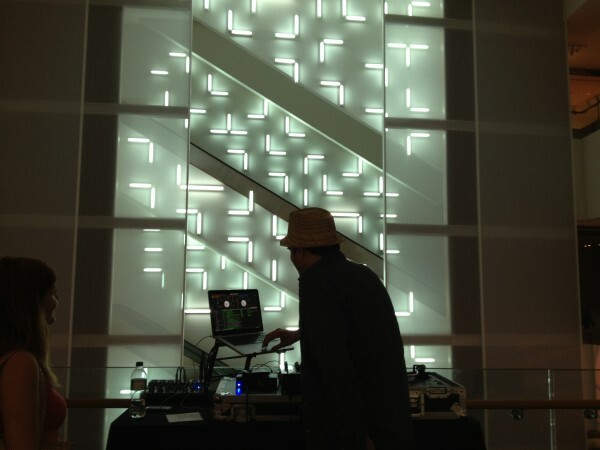 Kyle Long DJing in front of Robert Irwinâ€™s, Light and Space III, 2008. Wendy Lee Spacek is a poet who lives and works in Indianapolis, Indiana. She likes her city very much. She is a core volunteer of the Indianapolis Publishing Cooperative (Indy Pub Co-Op), publishes small editions of handmade books under the name Soft River and is an arts administrator at the Indianapolis Art Center. She will be posting monthly all summer long about her encounters with art, culture, creative experiences and resources in her city.